>> Where does the little to no cost for me come into play? This is an investment, it takes money to do it. But its a great investment. The no cost doesn’t come into play till your ROI (return on investment) plays out. If you understand and calculate net worth, that is all your property and assets BEFORE and AFTER this investment. You put out the money, put it in. As soon as the IRS pays you your TAX CREDIT, the 30%, average about $7,000 for most customers, then right there your property, has a higher value than the money you put out. Right there the little to no cost begins. If you just focus completely on the electrical output only and ignore that you actually OWN a expensive system and it has value as property. Then it depends on your site and production of power, and that can range from 5 to 12 years. One factor is how much you pay in power, like Hawaii can be as high as $.50 making it way faster to about 2 years, but national average is about $.12. 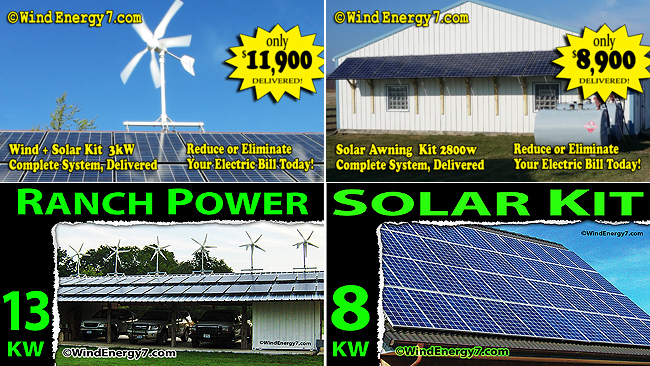 Another main factor is how much power you make, your wind and solar resources together with what kind of roof and angles to best harvest that wind and sun. A place like Oklahoma that has great wind and sun both VS a place like Ohio where I live have a big difference in production. BOTH will pay out and are worth buying the system, but of course, the guy in Oklahoma is blessed with more wind and sun that my system here in Ohio can do. An Oklahoma system will pay out a couple of years faster. But, you are talking about GOOD vs GREAT. The worst scenarios are paying out at about 10 to 12 years in pure energy production. So, worst case I see is about 12 years and that is 8% return on an investment. Any investor would tell you that a guaranteed investment, secured in asset property, that returns from 8 to 15% a year... is a GREAT INVESTMENT. That's exactly what this is. It takes an investment to do this, but it sure is a solid investment and that's why I have so many repeat customers who keep upgrading after they know how well it works.